Just a link to a map of the USA with the various terms for "the night before Halloween". I never knew that there were any terms for it. I took a stroll this morning to survey the scene of waste and desolation that was once London. The lush forests of Exmouth Market are no more. There was even a bin blown over. Yet amid all this I kept thinking about the connection between Cole Porter and "Frankly, my dear, I don't give a damn." Cole Porter's song is essentially a parody of this poem. Poor Dowson! Dead at 33. His most famous line "The days of wine and roses" is best known as the title of a 1962 film. And his sad refrain is best known as a jolly comedy. But how does this relate to the windswept remains of London? Well, here's the second half of the poem. I shall simply put the relevant words in bold. Ernest Dowson also invented the word soccer. *Since you ask, this is a line from Horace. It means I am not what I was in the reign of good Cynara, and the context is that he's too old for love. Cynara is some ex-girlfriend. Mind you, cynara is also Greek for artichoke. So it may be about fruit and veg. Just some links today. First of all, to a lovely article by Katy Steinmetz in Time Magazine about The Horologicon. Did I mention that it's been released in the United States? Did I? I did? Splendid. The Etymologicon is out in the US of A too. And to prove it, here is a link to Keith Urban's twitter feed. As the only country-music-loving etymologist in England, my work is now complete. 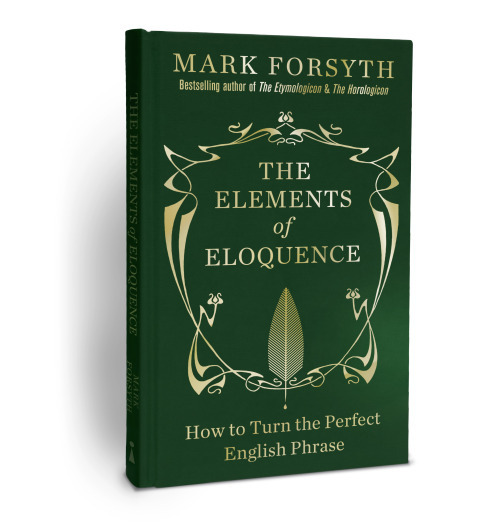 And now I'm going to fret and wait for the first copy of The Elements of Eloquence, which should be arriving this afternoon from the printers. Thus Jane Austen in Pride and Prejudice. Well, I am going to Brighton on Friday to give a talk on The Elements of Eloquence, after which I shall probably elope with someone unsuitable. Elope is a lovely word, especially if you leap into an elopement with an interloper. There are a whole bunch of lope-words spread around the languages of Northern Europe and they all mean pretty much the same thing: a stride, a run, a jump, a leap, a bound. There was Old English hleapan, and Dutch lopen, and Gothic hlaupan etc. It's therefore very hard to tell where exactly elope comes from, but aloper is first found in French. Meanwhile, somebody who runs in where he's not wanted is an interloper. He probably lopes along, and then leaps. There used to be a punishment in the Swedish army for Very Naughty Soldiers. Basically, all the other soldiers would form two rows, leaving a long narrow passage between them. The Very Naughty Soldier would then have to run down the passage, or gata, whilst all the other soldier tried to hit him as hard as they could. This was called the street-run or gat-lopp. But gatlopp sounds strange in English so we twisted it around and called it running the gauntlet. Finally, there was once a proper bit of a proper wedding in Old English called the Brydlop, which literally means Bride-Run, where the wife hurried off to her new home. If you're in Brighton, do come along. My new book, The Elements of Eloquence, is currently being printed somewhere in darkest, deepest Sussex and will arrive in the bookshops in early November. It's not about etymology, and it's not about strange words. It's about the figures of rhetoric. And you wonder to yourself why it's such a famous line. It is, after all, just a chap's name. It doesn't actually say anything more than "My name is Mr James Bond". It just says it better. Why? And you start to see a pattern. In fact, you can't believe that you never noticed the pattern before. But that's only because the phrases were never stacked up next to each other like that. The Ancient Greeks noticed that pattern: this-that-this. They called it diacope. Unfortunately, the figures of rhetoric don't get taught in schools any more. They used to be. Shakespeare would have had to learn them all by heart. But now, they're largely unknown. So I wrote a book. The Elements of Eloquence has one chapter on each figure, showing how it works, what effects it can have, and what lines it has made famous. It'll be in the shops on the 7th of November (in Britain that is). I hope you like it, dear reader, I hope you like it. And such a pretty cover. Once upon a time, there was a Latin noun scintilla and it meant spark. We all know what a spark is: it's the tiny little point of light that flies out of fire or fusebox. And because sparks are so tiny we got the English word scintilla, meaning tiny little thing, which is usually used in phrases like not a scintilla of doubt. But the Romans also made a verb of scintilla: scintillare, which meant to sparkle. And the past participle of scintillare was scintillatus. And because things that sparkle are bright and interesting and attract our attention, we got the verb scintillate. So one word came from the size of a spark, and the other from its brightness. But scintilla has one third child who's not nearly as obvious. As the Roman Empire fell and declined, people forgot how to spell properly and some people changed scintilla to stincilla. That's why the French ended up with a verb estenceler meaning to decorate something with lots of sparkly things. And so Medieval English got the verb stencellen meaning to decorate with bright colours. And that's why the pattern that you use to apply decorations is called a stencil. Not a scintilla of scintillation. Sorry for the lacunose blogging. The new book has now finally been sent to the printers. Of which much, much more soon. And just a link today to this article by me in The Guardian on 10 lost words. Just a link today to this article that I wrote for the Wall Street Journal on why words die out. The Horologicon is coming! Wearing a fifteen gallon hat and playing a steel guitar, The Horologicon is published in America today. Thus many great words will be returned to the land of their origin: from snollygoster, a C19th American term for a dishonest politician, to nurdle, the industry name for the little bit of toothpaste you squeeze onto your toothbrush in the morning. For those of you who don't know, The Horologicon is about all of the strangest and most useful words in the English language that nobody knows. All of them exist in the dictionary, but for some reason they've fallen out of use. And they must be brought back. Moreover, they're arranged by the hour of the day when they might come in useful. So nurdle is in the chapter for seven a.m. when you're busy scrubbing yourself in the bathroom. It sits next to duffifie, an old Scots term for leaving a [shampoo] bottle on its side to get the last bit out, and go to siege, a Medieval term for taking a crap. America and Britain have long been united by a common language. Now they can be united by an uncommon language; an extraordinary one. 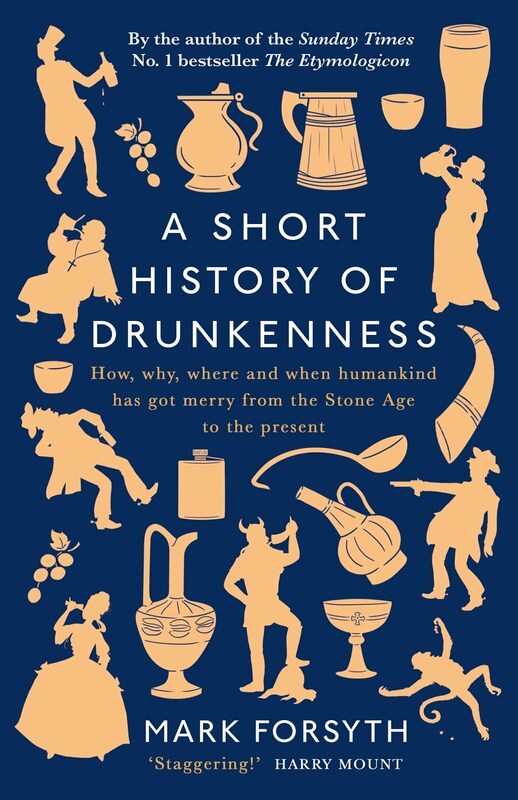 And look at the pretty, pretty cover provided by the lovely folks at Berkley Penguin.